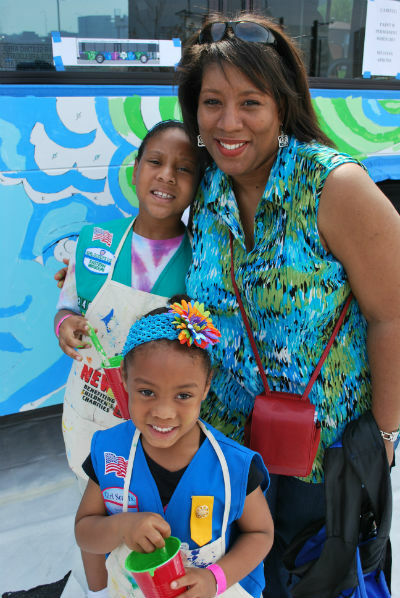 Girl Scouts of all ages celebrated the 100th Birthday of the organization with fellowship, food, fun, and … bus painting! On Saturday as part of the 100th Birthday Bash at the Chaifetz Arena, Girl Scouts and their troop leaders got the chance to paint one of Metro’s Arts in Transit Art Buses in honor of the organization’s past, present and future in the community. Click here to view the slideshow on Flickr. “We are thrilled work with Metro St. Louis on a project that is fun for our older girls, a great way to tell our story to the community, and an opportunity to invite everyone to celebrate our 100th Anniversary all year long,” said Donna Martin, CEO of the Girl Scouts of Eastern Missouri. Saturday turned out to be a beautiful day for the Girl Scouts to paint murals designed by illustrator and graphic designer Steve Edwards on each side of the MetroBus. “My daughter’s a Girl Scout, my wife’s a troop leader, and both our mothers were Girl Scouts,” said Edwards. Edwards has designed for the Art Bus program before, including last year’s Art Bus for 100th Anniversary of the St. Louis Society for the Blind and Visually Impaired and the 60th anniversary of The Delta Gamma Center for Children. “The MetroBus was transformed into a rolling work of art,” said David Allen, Metro Arts in Transit Director. “In about two weeks, this vehicle will join the Art Bus Fleet which is part of Metro’s Arts in Transit Program. The mural will stay on the MetroBus for one year and will travel various MetroBus routes around the area.” The Art Bus Fleet Program partners Metro with non-profit organizations in the community like the Girl Scouts of Eastern Missouri to raise awareness for their groups. This is beautiful seeing girl scouts learn about painting buses. Now the proper way to paint is to ALWAYS wear a mask or resporator to keep the fumes away from you. Painting outdoors is a good move, I have seen Ryno Templeton on Trick my Truck sometimes paint truck parts outdoors rather than in the booth. And just by watching him, he makes a good teacher. Those girl scouts seem to be nice artists. All they need to do is to keep practicing and we could see them as future painters for Metro. Girl scouts, KEEP PRACTICING!!! YOU ARE VERY GOOD PAINTERS!!! How come do I not get to know when the next Transportation Day is? I found out that Citizens for Modern Transit and Metro knows but the members of CMT and the public doesn’t get to know. Please get a hold of who does the planning for Transportation Day and let me know. Also have the director of Program Development give you the info. Once you get the info, post it. But don’t tell anybody in planning that you are posting it.